If you've ever listened to a podcast before, you might have heard an ad for Winc, a wine subscription service. And you probably thought, Wow, sounds luxurious. I'm here to tell you that you need this service — no, you deserve this service. 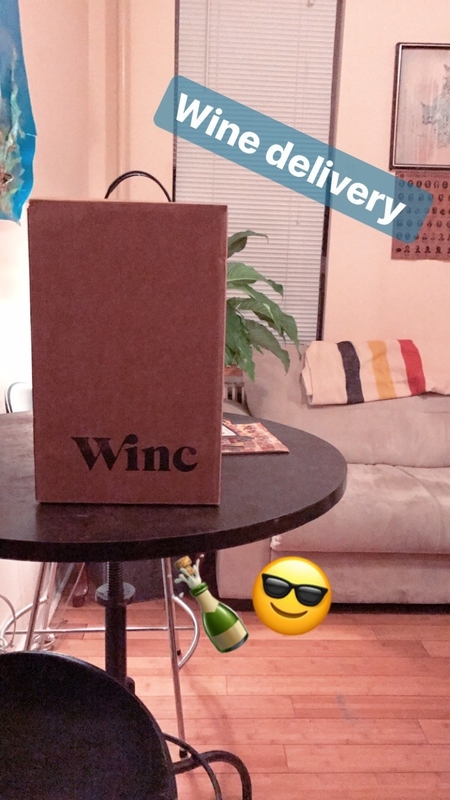 Winc sends (at least) four bottles of wine directly to your door each month. That means no more gaping at the wine selection in the store on your way home. That means no more frantic runs out to grab more booze when you have unexpected guests. Hell, you can fill up a bathtub and swim in it (no judgment). I love drinking and hate doing errands, so I decided to check out Winc after hearing the millionth podcast ad for it. The whole process takes about 10 minutes, and then, magically, a shipment of wine is on its way. To get a feel for what you might like, Winc provides a fun quiz about your tastebuds. They'll ask some softball questions, like "How do you like your coffee?" Don't be afraid to answer honestly — there's no barista around to judge you. At the end, you just need to decide your red-to-white wine ratio and then they select four wines that they think you'll like. Usually, these wines are $13–$15 each. If you don't like your choices, you can also click through their full inventory and pick some others (they have rosé too 😉 ). I decided to go with two whites, a red, and rosé. Once you complete check-out, you're officially signed up for the subscription, but don't worry! You can choose to skip months or even cancel the whole service altogether whenever you'd like. And long as you include at least four wines in your order, shipping is free! And thank god for that, because wine bottles are heavy. There's just one catch: Someone over the age of 21 needs to be home to sign for it. If you have a doorman or work from home, this'll be no sweat for you. Other people will have to have it delivered to work or to someone they know will be home. Also, some unfortunate states with intense liquor laws can't get deliveries. Sorry to the following: Alaska, Alabama, Arkansas, Delaware, Hawaii, Kentucky, Mississippi, Oklahoma, Rhode Island, South Dakota, and Utah. Luckily for me, my landlord works around the corner at the neighboring barbershop, so he was able to sign for me. The delivery is very securely packaged, so you don't have to worry about getting any broken bottles. It kind of feels like opening up a present. It also comes with a cool look book packed with pretty pictures and informative wine information, like the best ways to enjoy different varieties. Full disclosure: I'm not a wine person. But I know good design when I see it, and these bottles are *beautiful*. When a server asks me what kind of white I want, I just sort of stare at them blankly and say "...house?" Seriously, I know nothing. When I go into the liquor store to grab a bottle, I only look for two things: a low price and a cute label. They say you can't judge a wine by its label, but maybe you can? Because these wines taste as good as they look. I'm not a sommelier, so luckily Winc comes with a detailed flavor profile for each wine that breaks down what you're tasting. It's nice to have a guide to help you navigate through the scary world of wine tasting. Here's a look at what I got in my package: First up, the 2017 Alma Libre Pinot Noir — a Chilean red with a Instagram-worthy label. I'm not a red wine person, but I'm 100% a Alma Libre Pinot Noir person, apparently. Maybe it's the beautiful label, or the *notes of cherry* but I'm sold. I definitely recommend this to people who don't drink a lot of red wine, because it's light-bodied and more subtle in taste. Next, the 2016 Wonderful Wine Co. White Blend — a Californian white that lives up to its name. This is my favorite wine ever. It's floral and peachy — juicy, but not overwhelmingly sweet. Plus it has a screw top, which is a big plus for a philistine such as myself. I may continue my subscription solely for this awesome wine. Ruza Zinfandel Rosé — a Californian rosé I want to drink all day. I drank this next to a Christmas tree, but honestly it might as well have been palm tree — this is a very summery drink. You can really taste the watermelon, along with notes of cherry, strawberry, and rose petals. They also sell these in cans so you can bring them to the beach when the weather gets warmer. Finally, the 2016 Forma de Vida Verdelho — a Californian white with nice citrusy notes. Fruity and crisp are definitely the words I would use to describe it. It's a great bottle to give as a gift, thanks to its crowd-pleasing taste, and again, amazing label. So is a wine subscription worth it? If you're not overly picky about your wine, kind of lazy, and a bit of a lush, then YES. The wine is delicious (and more importantly gorgeous to look at), plus it's super fun to get a boozy present in the mail each month. Thanks to nice packaging, it feels like a real luxury, even if the bottles are only about a dollar or two more than what I'd normally pay. I won't say this is a money-saver, but the experience and convenience definitely makes it worthwhile. Get a subscription from Winc.com with wines starting at $13 (and free shipping when you order at least four bottles). If you order now, you can get $20 off! One month of Winc products was provided to BuzzFeed free of charge, but we were not obligated to positively review it.